JOHNSTON, R.I., USA—A new survey of U.S. risk managers, conducted by the Flaspöhler Research Group, ranks commercial property insurer FM Global as the top choice for “commercial property,” “business interruption (BI)/contingent BI,” “boiler and machinery,” “excess flood” and “terrorism” insurance coverage. The 2013 Risk Manager Choice Awards are published in the April 2013 issue of Property Casualty 360 ‒ National Underwriter, a magazine for buyers and sellers of property and casualty insurance. More than 300 risk managers were interviewed for the fourth biennial study and were asked to evaluate 62 insurers and 20 lines of business. Those insurance buyers could only rate companies with which they were familiar and only in regard to how those companies perform on factors the respondent considers to be important. For nearly two centuries, many of the world’s largest organizations have turned to FM Global to develop cost-effective property insurance, business risk consulting services and engineering solutions. 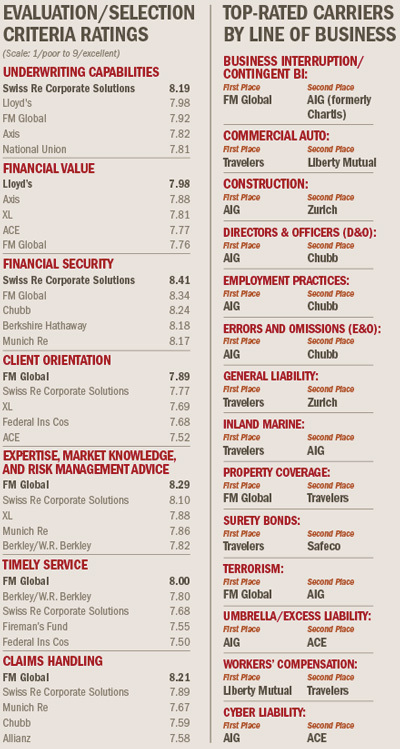 With clients in more than 130 countries, FM Global ranks 572 among FORTUNE magazine’s largest companies in America. The company is rated A+ (Superior) by A.M. Best and AA (Very Strong) by Fitch Ratings and has been named “Best Property Insurer in the World" by Euromoney magazine and the “World’s Best Supply Chain Risk Insurance Provider” by Global Finance magazine.